I think I smell kinda funny today. 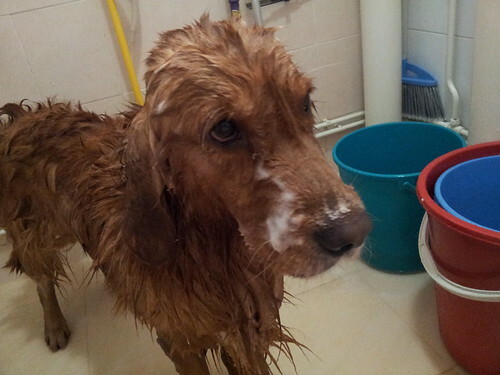 Every sunday is bathing day but today, instead of using my usual shampoo, my M started taking out sachets of shampoo samples that she got from the last ASD Tea Pawty goodie bag. 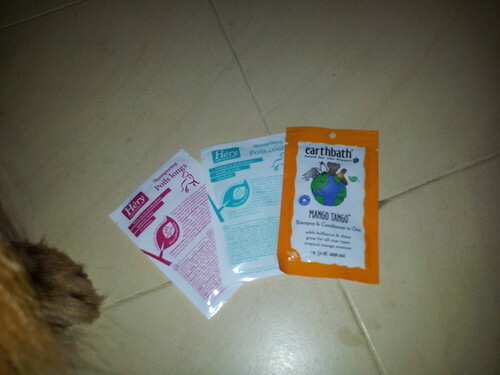 But apparently these sachets were made more for small dogs, as 1 packet is not enough to shampoo my whole body. So I ended up with different flavors on my back, sides and head. What's that smell on me? I think sample makers should give us bigger sachets, at least enough for one wash for a big dog like me. Now all I can do is hope that the smell will fade away. Maybe if I roll enough in grass, I'll smell less funny? They still laze around although I try to 'stare' them out.